The Museum’s Curator of Collections and Registrar, Nicole Nathan, talked to Daniel Casto about curating Quality is Contagious: John Economaki and Bridge City Tool Works. Museum of Contemporary Craft Curator of Collections and Registrar Nicole Nathan curated Quality is Contagious: John Economaki and Bridge City Tool Works in collaboration with fine-furniture-maker turned-entrepreneur-and-tool-maker John Economaki. Her challenge was to convey the interconnectedness of Economaki’s approach to work and life by exhibiting his furniture, tools, sketches, prototypes, and videos side by side. There is no separation between craft, design, and art for Economaki. All intersect and overlap — and all are crucial to his practice. Editorial intern Daniel Casto spoke with Nathan about how she approaches crafting an exhibition of this breadth of material and theme, and what makes the role of a curator both challenging and thrilling. 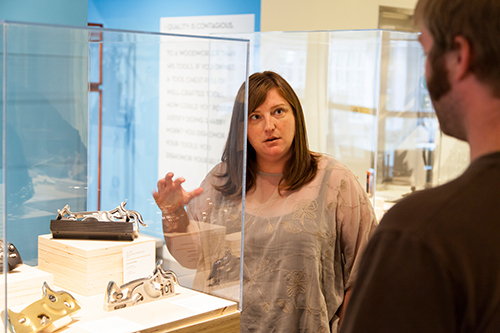 Nicole Nathan shows visitors through the “Quality is Contagious” exhibition. Photo by Matthew Miller ’11. UNTITLED Magazine: Hi Nicole. So you’re the Curator of Collections and Registrar here at Contemporary Craft. Can you tell us a little bit about that means exactly? Nicole Nathan: I oversee our physical object collection here at the museum—I monitor when things are going in and out of the collection, when they are being lent to other institutions, when they’re coming back, when we need to pull things from our collection for display. I also curate exhibitions based on people and pieces within the collection, or that have some sort of historical context that relates to it. UNTITLED: Did Quality is Contagious come about because of a piece that we had in our collection? NN: John has a piece, the [Vaughan Street] Dessert Trolley, that has been in our collection since the mid-80s. It was included in our book, Unpacking the Collection, it was featured in Craft in America in 2007, so that’s kind of the centerpiece around which this exhibition is — well, not necessarily based, but we wanted to tell his story, and having that piece gave us the means to do that. The exhibition is about John as a maker, as an artist, a designer, businessman — [as] a person who continues to make; but in different ways. He started out as a furniture-maker in the mid ‘70s, made some really amazing pieces which are part of the exhibition, and was hugely successful. He had a piece in the Smithsonian, he had all sorts of commissions, and then woke up one night unable to breathe because he had developed an allergy to wood dust. NN: Right. I can only imagine what kind of a crisis this would have been. But as a furniture maker, John had always made his own tools, and he then thought, “Well, maybe this is what I can do.” So he’s still a maker, he’s still an artist; but he had to refocus what he’s an artist with. UNTITLED:So when you’re in the role of a curator, and you’re presented with a strong personal narrative in that fashion, is that an asset, or is it difficult to juggle with what you want to present in your show? NN: I think that’s a question that you come up against constantly, because if you’re dealing with someone who’s really well known, chances are those stories and that narrative are out there. So it’s hard, because you still have to give room to that. But I think you can say, “Yes, that is one aspect of this, but here are some other things you might not know about…” You can use it as a tool, for lack of a better word, that leads people into other aspects of the show. UNTITLED: Is the primary focus of the show “the tools as art objects”? Do you think that’s contrary how most people perceive them? NN: I think it’s a different way of perceiving them than people might normally be used to. There are plenty of people who have visited the exhibition who are customers, and who have said, “Well these are the same tools I have in my shop, and they’re under glass now.” John has also always been a proponent of new technology and new ways of making, and that’s an aspect of the story that you wouldn’t see if you were simply a consumer of the tools. UNTITLED: At what point do you think an object, then, becomes worthy of that museum-level recognition? Where does it stop being a thing that my Dad buys on clearance at Sears, and become a thing that we can put in the museum here? NN: I think that comes down to a couple different things. One of them is the story — What is it about these pieces as tools? As beautifully designed pieces made to be handled, made for the hand, made for a connoisseur? What about that story is really compelling? The tools are also the physical manifestation of this idea that we’re trying to talk about, which is to think about making in a more expansive way. You can be an artist in many different kinds of ways, and it might not end up being the way you thought, but you can still be a maker. NN: Definitely, I think having that story is illuminative in many different ways for viewers. It’s not just “Here’s the first tool, here’s the last tool, here are all the tools in between.” I think having this rich contextual experience — what goes into each piece, how John has made use of 3D printing, the careful thought and myriad skills that go into making the final product — creates a context for a truly interesting narrative. I think we’re shining a light into a behind-the-scenes type thing. Maybe you even know the piece; but here’s what happens to get to that; here’s what the piece means. UNTITLED: How do you think the show interacts with the community of small business and craft and local production that Portland is so enthusiastic about? NN: Well, it’s the story of someone who built a worldwide business, but one that’s very small, one that’s based in Portland. So I think we want to ask, “What was it about Portland in the 1980’s — Which was dismal, which was not at all a place that people were trying to start businesses — [that] made John stay here? There was a community, there was an appreciation for contemporary crafts. John could sell his pieces, he could do research, he could look at other wood-turners, go to different galleries, become familiar with different artists. There were people to know. I think it was particular to Portland, and I think John embodied this idea of figuring out how you want to do a thing, and then really doing it, that’s really prevalent now. UNTITLED: So should we even talk about the question of what it means to be a “curator” with the way that word gets tossed around these days? Are there any ways that your personal curatorial methods can be seen in this show in particular? UNTITLED: Are there any questions we should be looking for in this show that might tie into The Tool at Hand, coming up? NN: Absolutely. The Tool at Hand poses the question to all different kinds of makers and artists: “If you could only use one tool, and that was it, what would it be?” And then to make a piece using only that. We also put out a challenge, and John did as well, to his subscribers, to make a piece using primarily one of John’s tools, and we juried them and put one in the show, and it’s beautiful. So I think having that aspect of using one tool, trying new things, and learning through that experience, is all about progress. And so much of Quality is Contagious is about that same process. UNTITLED: And making your life of creative practice adapt to those circumstances. NN: Yeah. What are the restrictions that have been placed upon you, and how do you respond to them while staying true to your creative self? Because if you’re creative, and that’s something that you need, then you’ll have to find some way to make that happen. You’re restricted, but so much is still open to you. Installation view of “Quality is Contagious: John Economaki and Bridge City Tool Works.” Photo by Matthew Miller ’11. Quality is Contagious: John Economaki and Bridge City Tool Works will be up through February 8, 2014. The Tool at Hand opens at Museum of Contemporary Craft October 3, 2013. Why would a museum exhibit tools? At Museum of Contemporary Craft, we prefer to ask when might a museum exhibit tools. That moment, for us, is when the tools exemplify values in keeping with an institutional goal to create exhibitions that show how craft and design intersect. John Economaki’s story is a decades long demonstration of dedication, entrepreneurship, innovation and experimentation. We know this publication and exhibition will inspire woodworkers, furnituremak- ers, photographers, and inventors. But we believe it will also inspire anyone who needs courage and conviction to change careers; who seeks business advice from someone who has experienced ups and downs; and those who doubt that handcrafting and technology are partners today and in the future. Every trade has its tools. Whether you are a chef or a dressmaker, potter or a writer, there are specific tools which enable successful completion of specialized tasks. The use of these tools leads to a memorable meal, beautiful garment, bowl or novel. We believe in good tools. We trust that they will provide reliable service in the construction of a quality finished product. What if the tool itself, however, is just as finely crafted, just as aesthetically compelling as it is functional? For the past 30 years, artist, furniture-maker, toolmaker, and businessman John Economaki has built his life and business around a core idea: a tool should be as compelling when not in use as it is when serving its’ intended purpose. In other words, a tool must be as beautiful an object as the objects it is used to create. John Economaki’s ongoing commitment to this idea is precisely why the Museum of Contemporary Craft organized an exhibition to share his story through the tools of Bridge City Tool Works with the community. John’s insatiable curiosity and drive to improve any thing around him is contagious. Everything is fair game for redesign. Listening to John rapidly explain shortcomings and opportunities with any tool is infectious and educational. He can articulate exactly how he intends to improve the tool in question, clearly describing how he can bring artistry to form and function. After just a short time with John, it would be nearly impossible not to believe that he could transform a successful furniture- making studio into an heirloom tool making business in a few short months. To say that the transition was overnight is no exaggeration. In the late 1970s, John found success as an artist who made beautifully crafted furniture, His work was included in Portland Crafts Exhibition in Sapporo, Japan (1979), and his signature NUTCRACKER (1980) was acquired by the Ren- wick Gallery, Smithsonian Institution after inclusion in a juried exhibition there. Known today as Museum of Contemporary Craft in partnership with Pacific Northwest College of Art, the Museum was founded in 1937 as the Oregon Ceramic Studio, and renamed Contemporary Crafts Gallery (CCG) in 1964. A furniture-focused exhibition at Contemporary Crafts Gallery in October 1981, and two one-person exhibitions in California in 1982 were followed by a one-person show at the Elaine Potter Gallery in San Francisco, exhibitions in New York, and commissions from as far away as Tokyo.1 The Museum of Contemporary Craft is proud that one of John’s most successful designs, VAUGHN STREET DESSERT TROLLEY (1979), is part of its collection and featured in Unpacking the Col- lection: Selections from the Museum of Contemporary Craft (2008). In 1983, John became ill with pneumonia, brought on from an allergy to his medium of choice: Rosewood. Based on medical as- sessments, he could not return to the studio to complete numerous commissions and scheduled exhibitions. Of these, one exhibition commitment was fulfilled, and a quick review of the names on the announcement reveals that John Economaki wasn’t giving up just any studio practice. His medical condition meant removing himself from the company of some of the most reputable furniture makers in the American Craft Movement: Gary Knox Bennett, John Cederquist, Sam Maloof, and Wendy Maruyama are only a few of the artists on this list who are recognized today as some of the most influential furniture makers of recent decades. When Jo Lauria included John Economaki’s TROLLEY in the publication Craft in America, it underscored his importance today as a part of the history of contemporary studio furniture. 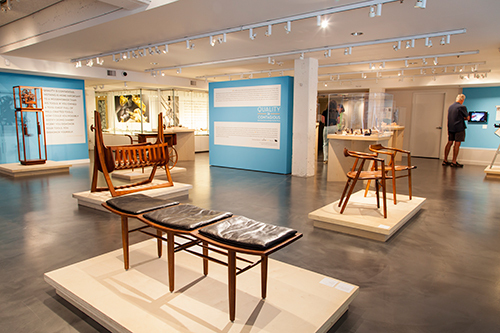 While it is as a furniture maker that John’s relationship began with Museum of Contemporary Craft, it is his approach to toolmaking that prompted MoCC to develop a retrospective exhibition to share his story with the community-at-large. Nicole Nathan, Curator of Collections and Registrar organized the exhibition and accompa- nying programs to demonstrate John’s unique position as an artist who can successfully shift and apply his intimate knowledge of how a tool must perform for a maker to how to make a tool itself. John understands and combines the way a tool must feel in the hands of a woodworker with his artist’s understanding of how that tool must look so a collector of tools must have it. And because of his strong aesthetic sensibilities and personal philosophies regarding beauty in all things with which one surrounds oneself, any tool made by John is an object of beauty and desire in its own right. This, however, is only a part of why the Museum believes John Economaki and Bridge City Tool Works makes sense for an exhibition and publication. John is tenacious, innova- tive, and experimental. An early adopter of CAD design and 3-D modeling and printing, his work flows seamlessly from sketches to a working prototype . Here, technology services the hand – John’s tools do not require any power other than the maker’s hands. They open a space for creative explora- tion while exemplifying creative application of technology. John has the ability to balance his own aesthetic vision with a customer-centered approach; this distinguishes his furniture in much the same way his tools stand out in a unique niche market of independent toolmakers. Museum of Contemporary Craft is known as an institution which honors the distinctive craft-based design legacy of the Pacific Northwest. It is a legacy which John Economaki helped establish – as a schoolteacher, furniture maker, one- time MoCC Board Member, and as a businessman who turned his passion for working with his hands into a multi-million dollar business that helps others cultivate their own passion for hand woodworking. This publication, lavishly filled with Joe Felzman’s exquisite photographs will inspire collectors who preserve the carefuly designed tools for which Bridge City Tool Works is recognized as a pioneer, and provide an aspirational model for anyone who, like John, doesn’t “want to surround myself with anything that isn’t passionately made.”2 At MoCC, we believe that this story of a studio furniture maker who transitioned nearly overnight into a successful toolmaker and businessman with international clientele will educate and inspire future generations to aim to be the best in their field, and, hopefully, to seize opportunities to live a life of creative practice. This is a local story told through John’s voice and Joe’s lens – a story which we know will have an impact far beyond Oregon. 1 Archives of Museum of Contemporary Craft in partnership with Pacific Northwest College of Art. Gupta Wiggers, February 16, 2013. A life of creative practice. We hear that phrase and think we know what it means. Naming an example seems easy. But naming someone whose life moves beyond glimpses and flashes to exemplify a holistic way of life where every aspect is true to that principle is challenging. What has become clear to me as I research and develop the exhibition Quality is Contagious is that John Economaki manifests this principle – through his furniture, his designs for Bridge City Tool Works, and his approach to life. John approaches everything he does so with the same methodology: intellectual curiosity through the lens of artist and maker, designer and entrepreneur. Our goal at Museum of Contemporary Craft is to create an exhibition which communicates all aspects of John Economaki’s approach to work and life by combining his furniture, tools, sketches, prototypes, Joe Felzman’s photographs, videos, and interactive programs to give visitors the opportunity to understand the life and work of this innovative Oregon-based entrepreneur. Conversations fill the research for this exhibition. In one of these, John relayed his disappointment with a recent purchase of a mezzaluna. The handles were uncomfortable, it was poorly made, and in sum, it did not do its intended job. John took it upon himself to reimagine it and make it better. The excitement around the process of prototyping, finding better materials, making a better tool, and bringing artistry to something pedestrian was obviously intoxicating for John. My ongoing conversations with John casually yet repeatedly reveal his process – how he listens and observes every thing and every day. His ideas for redesigning the mezzaluna led me back to the Museum’s archive, reminding me that he took the same approach with the VAUGHAN STREET SERVING TROLLEY he’d made in 1979. Commissioned by the owner of an elegant Portland restaurant, the trolley needed to satisfy a number of requirements: it had to be a specific height, include a silverware drawer, have a shelf for French pastries, navigate easily in tight quarters, be expandable, etc. Instead of viewing these specifications as restrictions, John saw the opportunity to make a beautiful, func- tional, and innovatively designed object. In addition, the wheels were designed to accommodate a number of surfaces, using a forgiving and resilient material, leather. The trolley became one of his most popular designs, and an object worthy of preservation and care to be shared with future generations through its inclusion in the permanent collection of Museum of Contemporary Craft. John Economaki’s work was shown at Museum of Contempo- rary Craft numerous times during his years of furniture making. Economaki also served on the Board of Directors from 1980-1984, helping to shape the focus and standards for the organization as the American Craft Movement and new approaches to furniture surfaced in the 1970s. When Museum of Contemporary Craft re-opened at its current location in 2007 and featured the exhibition Craft in America, the VAUGHAN STREET SERVING TROLLEY was added to our local iteration of the exhibition. In preparation, some restoration work needed to be done to the wheels. We contacted John to perform this work. I was fascinated to meet him, having recently worked for another institution that collected stagecoaches. The similarity in construction between the wheel on the trolley and that on a stagecoach struck me as remarkable. Both make use of wood construction, but with an added material on the exterior of the wheel – iron in the case of a coach, leather for the trolley – to bol- ster longevity, the ability to navigate rough terrain, and keep both passengers and pastries safe. Watching John repair the wheels, his deep love of materials and process were visible and inspiring. And again, the same approach of merging functionality with aesthetics can be seen with the object that started his transition from furniture maker to tool maker in 1983: the TS-2 8” MASTER TRY SQUARE, which began in Rosewood and brass and its latest iteration in the TS-2V2 TRY SQUARE, made of machined stainless steel or anodized aluminum. The materials may have changed, but his approach to the object has not. You can see that same philosophy and responsiveness first-hand in tool making—and how John is wiling to shift, change, and try new materials if they create a better functioning object. These three objects show a through-line of creativity and how John chooses to make, whether it is a simple kitchen implement like a commercially made mezzaluna, a piece of his own furniture, or a Bridge City tool. All three utilize his methodology of creative practice, an idea you will see running through the exhibition, which will include his furniture, sketches, videos of his tools in action, and more. Moving beyond just the objects and texts, we aim to create an exhibition that exemplifies his approach to life. If not a maker of tools, John Economaki would still work in this same way – of this I am confident. This approach relies heavily on that of process – it is central to how John works. The process of making each piece better is ongoing, and making use of new materials and ways of making drives his own work and practice. Designing the foxtail plane began with an idea of how to make the handle feel better in the hand. A sketch on a napkin was then transferred to Photoshop to be manipulated, elongated, pushed, and pulled. This file makes its way to a Wacom inter- active drawing tablet where it is manipulated even more. On to a 3-D printer where a prototype is produced. It is then held, tested, evaluated, and pronounced ready – or not yet ready for production. While the foxtail plane appeared to be perfect on the screen and in process, the model felt awkward in the hand, hit in the wrong places, and proved uncomfortable to use. Back to design – working until it is just right. The design process is only one part of the fine balance of own- ing and running a business. As John explains in this publication, and we present in the exhibition, to make this kind of work succeed requires knowing when to be the artist/designer/crafts- man and when to switch to the spreadsheet/human resources/ business person. Strengthening the other hemisphere of the brain and being agile enough to toggle from one to the other is key to keeping a creative business alive. At any given time, you may encounter John the toolmaker, the furniture designer, the CEO of a business, client, or blogger. Each is a different manifestation of John. It is this complexity which makes John a fascinating subject for a Museum exhibition, and prompted our desire to connect broader communities with John through this project. One hallmark of being a smart business owner is knowing when to embrace new technologies, better ways of working, and change. John has done this throughout his career and is keen to try new things which make his design projects more efficient and productive. Bridge City Tool Works was one of the first companies to use digital technology, CAD design – more commonly used by architects – Photoshop and interactive tablets to speed the process and produce better products. 3-D printers provide John with a prototype in short order so design changes can be made quickly and effectively. John not only experiments with new technologies, but he is also clear on the limits of his own expertise – and when he needs to bring others into his work to achieve new levels of success. This is how his relationship with Joe Felzman developed; John knew instinctively that the images of his furniture had to embody the same artistry, design, and attention to detail as the objects themselves. Additionally, the image had to stand in for the physical object in jury submissions, catalogs, and advertise- ments. Showcasing how the collaboration exceeds what each could achieve individually is one of the goals of this exhibition. The aesthetic strength of each tool and piece of furniture designed by John is un- deniable. As I prepare the checklist for the exhibition, his chair, table, try square, and plane are, for me, timeless examples of truth and beauty in materials and design. They remain as relevant and fresh as when they first premiered. The aesthetic principle guiding John’s furniture work still directs his design work in creating tools, as seen in this quote from American Craft magazine, Aug/Sept 1982: “My intentions as a woodworker can be summed up in one word: simplicity… I don’t have a cerebral approach to my craft. It’s a rather time-consuming and painstaking process of identifying every ugly element in a piece. I either remove or modify it. What remains, I hope, is a simple form that maintains some structural and aesthetic dignity.” Regardless of whether his materials shift from Rosewood and brass to cast and colored aluminum, the guiding tenet remains steadfast. Pieces are skeletonized and stripped down to their very core, illustrating that John is not tied to particular materials or methods if they no longer serve the purpose of structural and aesthetic dignity. Listening, observing, and innate curiosity drive him to take advantage of new technology, ways of working, and opportunities for new combinations of materials to serve the tool and customer. Quality is Contagious: John Economaki and Bridge City Tool Works is a retrospective offering the opportunity to connect you, the visitor, with the multi-faceted approach of John Economaki’s making, and to illustrate how his holistic creative practice permeates all aspects of his life. There is no separation between craft, design, and art with John Economaki. All intersect and overlap – all are crucial to his distinctive business and practice. When faced with a seemingly insurmountable challenge of changing your life’s focus overnight, we default to our foundational selves. For John Economaki, who went nearly overnight from artisanal furniture craftsman to designer of tools, his foundational core became the driving force. You may know him as a toolmaker, or a business owner, or an artist. We, at Museum of Contem- porary Craft, want you to see and understand how he is all of these at the same time, and to inspire you through this exhibition to use your own foundational core to create lives that exemplify your own creative abilities. The segment aired October 31, 2013. The segment can be viewed on Oregon Art Beat. Join Curator of Collections, Nicole Nathan, for an in-depth look at MoCC’s most recent exhibition. Join furniture maker turned woodworking tool designer John Economaki as he and other guests discuss entrepreneurship in Portland. When local furniture designer John Economaki developed a severe allergy to wood dust, he turned from making furniture to making heirloom hand tools for woodworkers. Drawing on his background in industrial design and knowledge of construction needs, Economaki established Bridge City Tool Works in 1983. Using the most contemporary digital technology, Economaki designs tools to stand the test of time. The company’s products, sketches, and tools from the past thirty years will be on view for the first time. 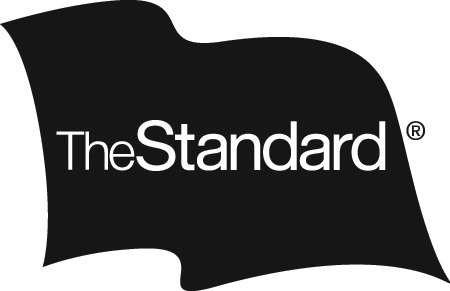 The exhibition will be accompanied by interactive programming in The Lab and provides a Portland connection to upcoming exhibition The Tool at Hand.